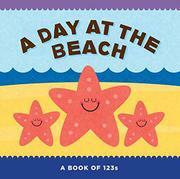 A counting book from one to 20, featuring Starla the starfish. Starla counts everything she sees: clownfish, clouds, kids in inner tubes, sandwiches, sand toys, seashells, and more. Each page (or double-page spread for the larger numbers) includes a large numeral on the left, brightly colored items to count, and a simple sentence in large type at the bottom of the page. “Starla has sixteen new octopus friends. / Seventeen kites fly in the wind.” Companion title A Day at the Farm introduces each letter of the alphabet with a sentence that includes multiple words that feature that letter. While the counting title is appealing and effective in its simplicity, the alphabet book, which sets out to showcase each letter by framing it with a farm-related scene or chore, suffers from some odd choices that lend it a haphazard air. The (notoriously difficult) letter X is particularly puzzling for an audience just beginning to learn its alphabet: “The excited fox piles fruit next to a box.” For Y, the text “Farmer Al makes yellow yarn” is paired with an image that makes it look as though the farmer somehow plucked several skeins of yellow yarn from a white sheep.